Can you open a saving bank account within 5 minutes from your phone? Is that possible? Yes, now that is possible. India’s private sector bank, Kotak Mahindra Bank has launches country’s first Digital Bank Account named – Kotak 811, which is fully based on the Internet. 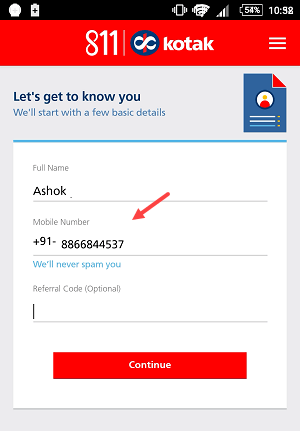 You can open Kotak 811 saving account at home on the mobile phone. You require only Aadhaar number and PAN card number. Today I will tell you Step by Step guide how can you open your Kotak 811 saving account online in just 5 minutes. 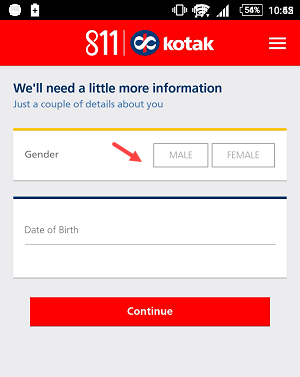 Kotak 811 is a completely digital account, which you can access on Kotak bank mobile application available on Android and iOS. So let’s open Kotak 811 savings account online. Before the start, keep these two things in your hand (1) Aadhaar card (2) Pan card, you need to enter aadhaar & PAN number details during the application process. 2 Now on the next screen you have to type your Full Name & Mobile number. 3 In the next screen, you have to enter an OTP that came on your mobile number. Type OTP and proceed. 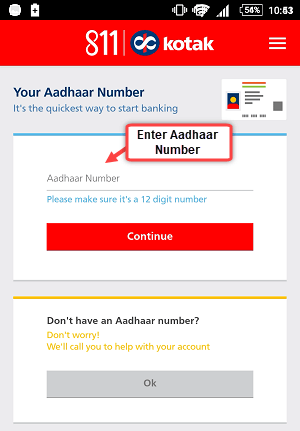 4 Now you have to type your 12-digit Aadhaar Number, type and proceed. 5 In the next screen, select your Gender and enter your Date of Birth. 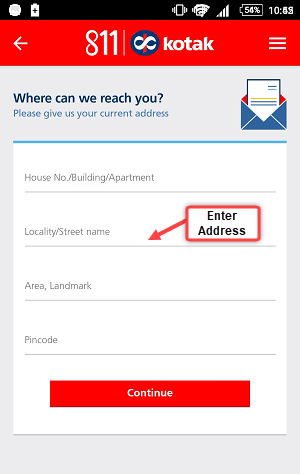 6 Now you have to type your full address, enter address correctly and proceed. 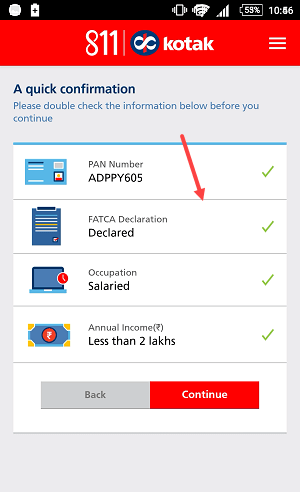 7 Now you have to give your PAN number, occupation, Annual income information in the next screen. After adding all the details, tap on continue. 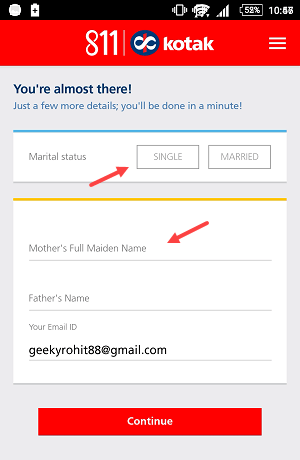 8 Now select your Marital Status, enter Mother name & Father name and your Email Address. 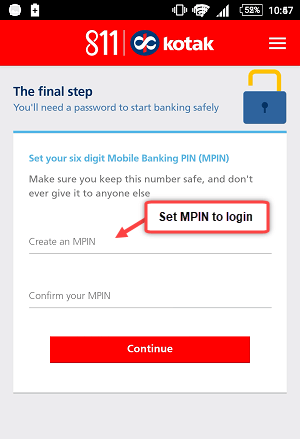 9 Now in the next screen you have to set 6-digit MPIN which will be used to login to Kotak Bank Mobile Application. 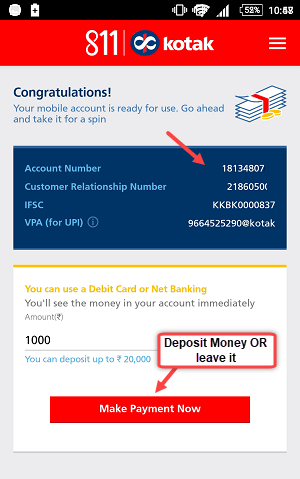 That’s it, your Kotak 811 account opened, you can see your account number, CRN number, IFSC code in the next screen. Here you can also deposit money online in your account, type Amount and tap on Make Payment Now, or you can leave it. After the account is open, you can login to Kotak Bank Application and view your account online and do many things like fund transfer, recharges. 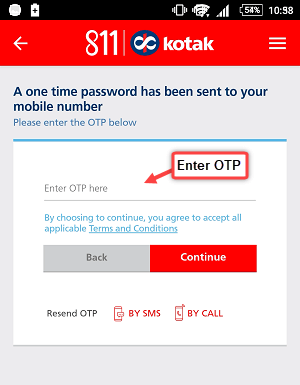 So in this way you can open Kotak 811 account within just 5 minutes. Because you have completely opened this account online so there are some limitations in it too. You can only deposit Rs.20,000 monthly. If you wish to remove this limitation, you can upgrade your account and remove this limitation. To remove the limit of your 811 account, just visit your nearest bank and verify your aadhaar using e-KYC. Remember you must do full KYC within a year, else your account can be closed. Q.1: 811 What should I do after opening an account? Answer: After the account is open, just log in to Kotak Mobile Banking application and you can do many things like Fund transfer, recharges, book ticket. Q.2: How to deposit money in the account? Answer: You can deposit money through online payment gateway or by visiting the nearest branch. Q.3: How Much Money Can Deposit? Answer: If your account is not Full KYC compliant, you can deposit only 20,000 monthly and can keep only 1 lakh in the account. To remove this limitation, you can go to Bank and complete Full KYC. Q.4: How to complete Full KYC? Answer: Visit Your Nearest Kotak bank and verify your details or call 1860 266 2666 to fix an appointment. Q.5: What is the Virtual Card and how to use it? Answer: This is not a physical card. You can view this card in the mobile banking application. You can use it online, as well as shops. Q.6: Can i Apply for the physical card? I couldn’t register my aadhar number while logging in, but now I want to add my aadhar to get the virtual debit card. Can you help me how to upgrade to 811 from 811 lite? Hey now you need to visit bank with aadhaar or call them they will visit at your home and complete kyc process. Yes. With kotak 811 saving account you will get cheque book also. Remember Complete your kyc within 1 year. You can call bank person to visit home to complete kyc at home.